NOTE: Papua New Guinea is a remote destination that is undeveloped by Western standards. The accommodations maybe rustic but are the best available. The food is simple but tasty, and the weather is unpredictable, although generally hot and humid. Upon arrival in Port Moresby you are transferred to your luxury hotel in this, the capital city of Papua New Guinea. Papua New Guinea is a country of over four million people speaking 700 different languages. Port Moresby is a cosmopolitan city, embracing technology and development while trying to retain the traditional values of its varied population. Enjoy the remainder of your day at leisure to relax after your flight. Port Moresby is a blend of old and new. Remnants of its colonial days can still be found downtown, while elements of the traditional way of life are maintained in the nearby villages. This morning, your half-day sightseeing tour begins with the Burns Peak Lookout, Fairfax Harbour and Airvos Avenue. Drive to the Hanuabada stilt village, the city’s original Motu village, then on to Ela Beach and the New Guinea Art Warehouse. See the National Museum and Parliament House, which exemplifies the striking harmony of modern architecture and traditional design. It’s constructed in the style of a Sepik River Haus Tambaran (spirit house), and offers a collection of impressive carvings, mosaics and murals from artists and craftsmen from across the country. Next, view a wonderful array of local, exotic plant species at the lush Port Moresby Nature Park, the Bomana War Cemetery, then make stops at a handicraft market and the fresh food Waigani Market. Your sightseeing tour ends at the airport in time for your afternoon flight to Tufi, located on the northeast coast. Upon arrival in Tufi you are escorted to your resort, where you may enjoy the rest of the afternoon at leisure. Perhaps you’ll choose to snorkel or explore on one of the stunning beaches nearby. Tufi is known as the “Fjordland of Papua New Guinea.” This morning, travel by boat into one of the remote areas to meet with local tribesmen and learn about their culture. At the fjord entrance local villagers adorned in traditional dress invite you on an expedition via outrigger canoe. Travel up river, deeper into the fjord where the tribesmen believe spirits and sorcery run wild. Reaching the end of the fjord, disembark your canoe to follow the villagers on a guided walk through the rainforest to a sacred area. Learn how to make sago, a food staple extracted from the sago palm. Discover how the tribe employs locally-sourced materials to maintain their traditional lifestyle, including baskets woven from various river plants that are used to catch fish and gather native foodstuffs. You are also taught about bush medicines, fire-making, mat-making, and traditional tattooing. This morning, enjoy a relaxing two-hour fjord cruise. Gaze upon the steep 500-foot cliffs that seem to plummet into the sea, and admire the beautiful flora and fauna. The waters around these tropical fjords are clear and calm, a scuba diver’s paradise. Coral outcrops are abundant with fish such as tuna, mackerel, barracuda, white tip and black tip reef sharks, hammerheads and rare white hammerheads. Turtles, manta rays and eagle rays can also be seen cruising by. Enjoy a swim or simply relax on board. 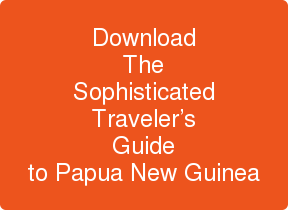 Depart Port Moresby early this morning on your flight to Rabaul (Kokopo) on the island of New Britain. Upon arrival you are escorted to your resort overlooking the harbor. Enjoy the rest of the morning at leisure, relaxing after your early start to the day. After lunch, a harbor cruise will provide an up-close look at both the Vulcan and Tavurvur volcanoes. Cruise into Simpson Harbour, one of the deepest ports in the world. Pass by the “Blue Lagoon" and circle the "Beehives," two remarkable rock formations set in the middle of the harbor. Arrive at Matupit Island, which bore the brunt of Mt. Tavurvur’s last eruption. Travel to the base of the volcano to watch as the men of Matupit dig for megapode eggs through several feet of volcanic ash. When the Tavurvur and Vulcan volcanoes erupted in 1994, the region was covered by up to seven feet of heavy ash. Your cruise continues to Big Pigeon Island, a nature reserve and host to spectacular marine life. Admire the beauty of the island and take time to relax and enjoy world-class snorkeling. During today’s full-day tour of the Gazelle Peninsula, discover the history of East New Britain. Start with a visit to the Bita Paka War Cemetery, the resting place of more than 1,100 Commonwealth servicemen from World War II. Visit the Kokopo War Museum, which hosts an extensive range of war relics and reminders of the Japanese and German occupation of East New Britain. Next, visit the Japanese Barge Tunnel, part of a system of 435 miles of underground passageways that kept Japanese craft hidden from detection by the Allied Forces. In Rabaul, tour Admiral Yamamoto's Bunker, the underground command post of a key figure in the Japanese military during World War II. Also visit the historic New Guinea Club & Rabaul Museum. Next, travel to some magnificent natural hot springs before visiting the Volcano Observatory. Next it’s on to a former Japanese submarine base, where you can snorkel in the waters of the Pacific Ocean amidst a plethora of tropical fish. The Duke of York Islands is a group of islands that make up part of the Bismarck Archipelago. Crowned with pristine white sand beaches, the surrounding island waters are a magnificent deep aqua blue. First sighted by the British navigator Philip Carteret in 1767, the islands became an important 19th century trading post. Enjoy your morning at leisure. Relax on the beach or partake in optional activities, including snorkeling, fishing, bird-watching, or take a tour of the nearby village. This afternoon you are transferred to the Rabaul airport for your flight to Kavieng on the island of New Ireland. Upon arrival you are escorted to your deluxe accommodations — traditional bungalows designed to blend into their tropical surroundings. After a sumptuous breakfast, take a 20-minute boat ride to begin your full-day drive along the stunning, coastal Boluminski Highway. Visit the largest tree house in the world, then, stop at Poliamba Plantation to learn how vegetable oil is made. In the village of Laraibina, visit Cathy’s Eels, an eel farm set next to a freshwater stream. These silky smooth creatures can grow up to 4 feet in length, and your welcome to hand-feed and pet them. Enjoy a picnic lunch at the Fissoa River with time for a swim before continuing to your last stop, the village of Libba. Here you meet malagan master carver, Ben Sisia and learn about this unique style of carving in which one figure is intricately interwoven with another. Swim and snorkel in the beautiful tropical waters along the reef surrounding the island this morning. Depart Kavieng on the morning flight to Port Moresby where you are escorted to your hotel.